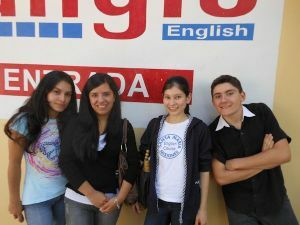 English is now increasingly sought as a skill in Paraguay when people apply for jobs, but the level of English in Paraguay remains very low as yet. Santa María is becoming famous for the high level of English taught here, thanks to an ever-renewed stream of volunteers from the UK and other English-speaking countries. SMEF covers the cost of teaching materials and exams, and the students pay nothing, but they have to work hard to get into the course, and to progress in it. The course has been running since 2000 and in that time we have enabled our Paraguayan students to obtain as many as 220 certificates with Cambridge English Language Assessment: from Young Learners (63 certificates), through Key (62) and Preliminary (33), up to the well-known First Certificate (15), the Certificate in Advanced English (3) and the Teaching Knowledge Test for teachers of English (39 so far for our Paraguayan student teachers). In addition, five students have passed their Business English exams: three taking Vantage (one with a grade B, and two with grade C) and two taking the Preliminary exam. In recent years we have found the great benefits of running English classes for children, to give them an early start so that they can progress faster and further. We now teach children from 8 years of age, and prepare some of them for the Cambridge Starters exam and Cambridge Movers. The children who choose to come to our classes are so keen that they gather outside the Institute well before their class begins, and then rush in with enthusiasm. 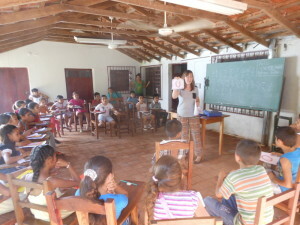 The frequency of children’s classes, however, depends on the availability of our volunteer teachers, as the classes are quite labour-intensive. When necessary we organise a crèche to enable mothers to come to English class who would otherwise be unable to study. 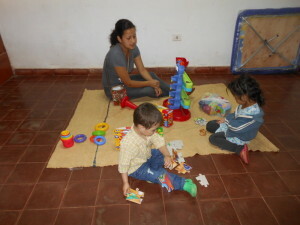 We have received some fine donations of toys for under-5s from our supporters in the UK.